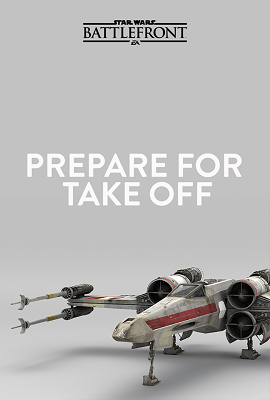 Electronic Arts has posted a new teaser image to its Star Wars Facebook account telling fans to "prepare for take off." One of the biggest disappointments many have expressed with Star Wars: Battlefront is that the game, at least at launch, won't come packaged with space battles. That being the case, if a recent teaser image from Electronic Arts' official Star Wars Facebook page is any indicator, franchise fans itching for high speed X-Wing/TIE Fighter dogfights might still have something to look forward to when the game releases later this year on November 17th. The image in question, posted to Facebook this past Saturday, simply featured the Battlefront logo above an X-Wing and the words "Prepare For Take Off." In a brief message above that, a company representative had also written "new mode incoming..." While this in no way paints a clear picture of what the publisher and the game's developers at DICE have planned, many understandably jumped to the conclusion that it would be a new mode focused on the game's fighter combat. Responding to Facebook commenters, EA was quick to shut down any suggestions that it might be space battles, but did post other replies that seemed to further the idea that the new mode will be snub fighter-centric. "We're focusing on air battles and dogfights that take place on the vistas of our planets rather space," the company said, replying to one Facebook user. While the continued absence of space battles from the game is likely to remain a sore thumb subject for veterans of the original Battlefront games, I'm going to go ahead and say that the presence of any sort of game mode wholly dedicated to air combat would be a huge plus for me. Here's hoping EA and DICE dish out more details in the near future.